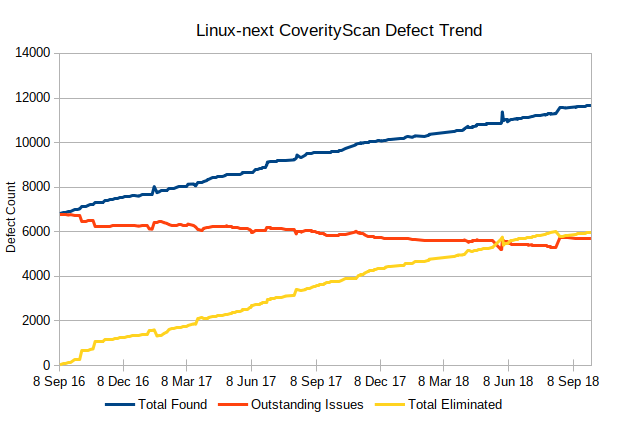 As one can see from above, CoverityScan has found a considerable amount of defects and these are being steadily fixed by the Linux developer community. The encouraging fact is that the outstanding issues are reducing over time. Some of the spikes in the data are because of changes in the analysis that I'm running (e.g. 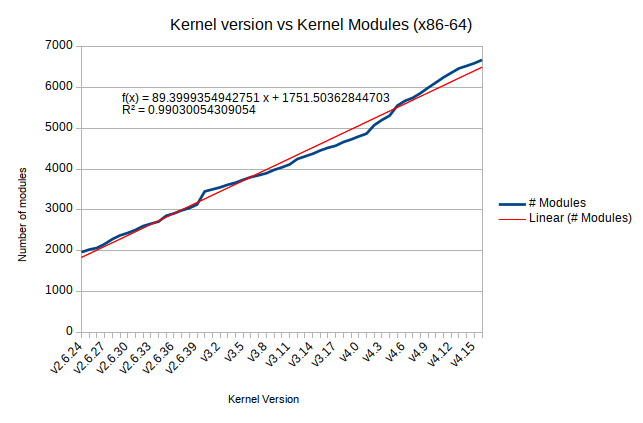 getting more coverage), but even so, one can see a definite trend downwards in the total defects in the Kernel. With static analysis, some of these reported defects are false positives or corner cases that are in fact impossible to occur in real life and I am slowly working through these and annotating them so they don't get reported in the defect count. 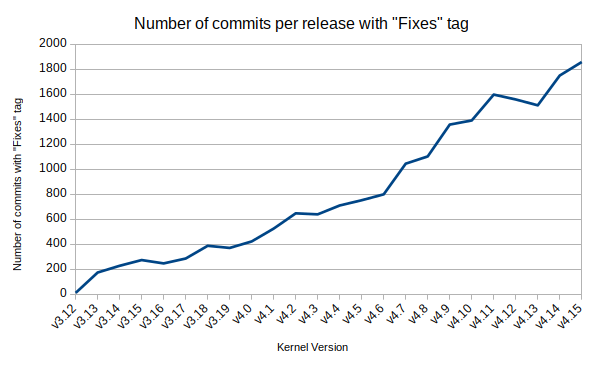 It must be also noted that over these two years the kernel has grown from around 14.6 million to 17.1 million lines of code so the defect count has dropped from 1 defect in every ~2100 lines to 1 defect in every ~3000 lines over the past 2 years. All in all, it is a remarkable improvement for such a large and complex codebase that is growing in size at such rate. The low-latency kernel offering with Ubuntu provides a kernel tuned for low-latency environments using low-latency kernel configuration options. 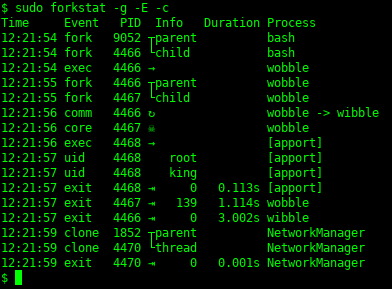 The x86 kernels by default run with the Intel-Pstate CPU scheduler set to run with the powersave scaling governor biased towards power efficiency. While power efficiency is fine for most use-cases, it can introduce latencies due to the fact that the CPU can be running at a low frequency to save power and also switching from a deep C state when idle to a higher C state when servicing an event can also increase on latencies. ..the above runs a cyclic measurement collecting latency counts in 100ns buckets with a clock_nanosecond wakeup interval of 10,000 nanoseconds with zero % load CPU stressor and timer slack set to 0 nanoseconds. This dumps latency distribution stats that can be plotted to see where the modal latency points occur and the latency characteristics of the CPU scheduler. I also used powerstat to measure the power consumed by the CPU package over a 60 second interval. 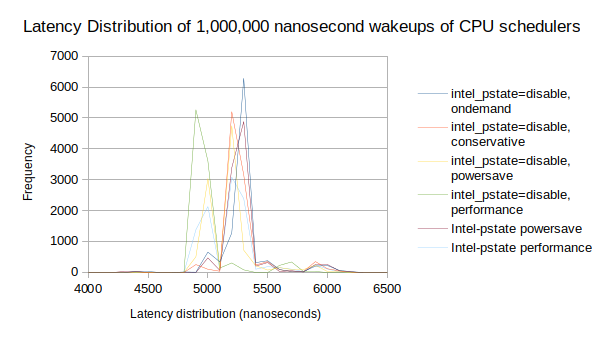 Measurements for the Intel-Pstate CPU scheduler [performance, powersave] and the ACPI CPU scheduler (intel_pstate=disabled) [performance, powersave, conservative and ondemand] were taken for 1,000,000 down to 10,000 nanosecond timer delays. Strangely the powersave Intel-Pstate is using the most power (not what I expected). 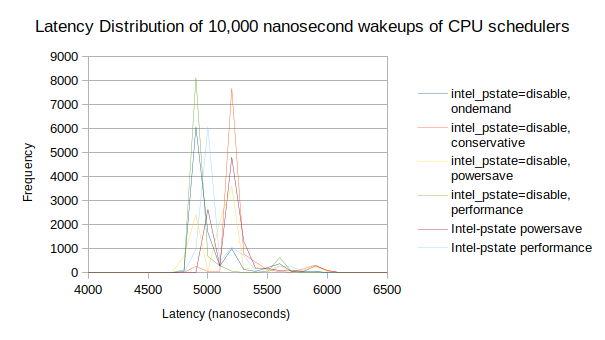 The ACPI CPU scheduler in performance mode has the best latency distribution followed by the Intel-Pstate CPU scheduler also in performance mode. ...and also has the most responsive low-latency distribution. 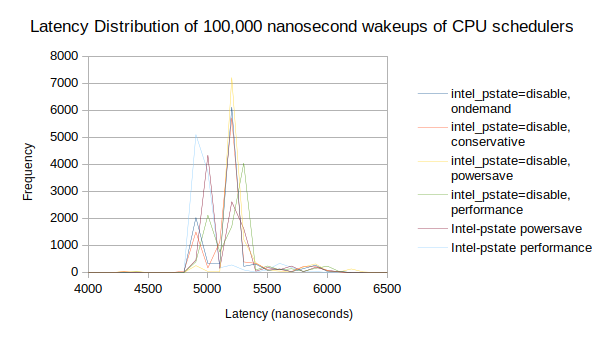 In this scenario, the ACPI CPU scheduler in performance mode was consuming the most power and had the best latency distribution. It is clear that the best latency responses occur when a CPU scheduler is running in performance mode and this consumes a little more power than other CPU scheduler modes. 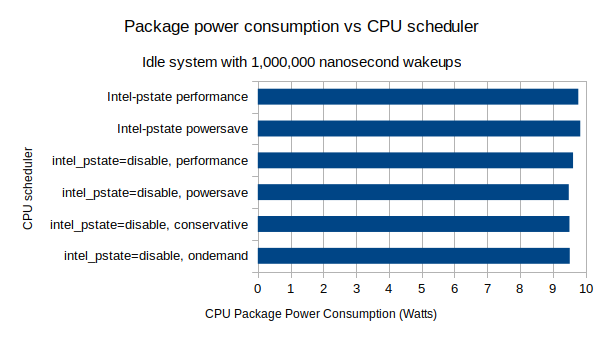 However, it is not clear which CPU scheduler (Intel-Pstate or ACPI) is best in specific use-cases. The conclusion is rather obvious; but needs to be stated. 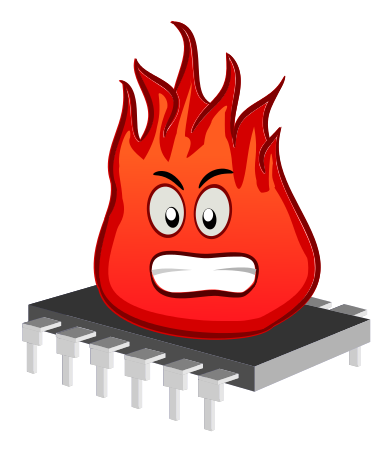 For best low-latency response, set the CPU governor to the performance mode at the cost of higher power consumption. Depending on the use-case, the extra power cost is probably worth the improved latency response. As mentioned earlier, this is a somewhat contrived experiment, only one CPU was being exercised with a predictable timer wakeup. A more interesting test would be with data handling, such as incoming packet handling over ethernet at different rates; I will probably experiment with that if and when I get more time. 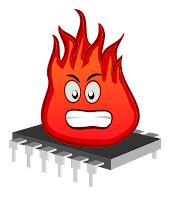 Since this was a synthetic test using stress-ng, it does not represent real world low-latency scenarios, however, it may be worth exploring CPU scheduler settings to tune a low-latency configuration rather than relying on the default CPU scheduler setting.